Change the power of your AEG on the field in seconds! 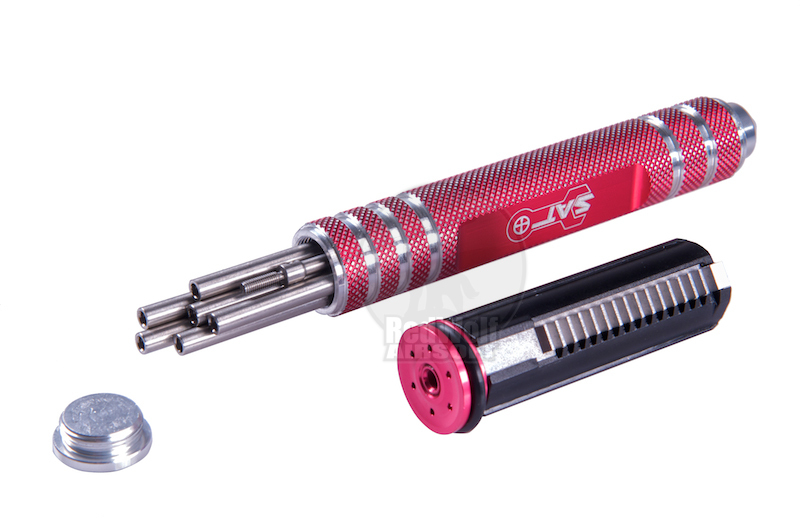 The Variable Velocity Device or VVD is a set that includes a piston and piston head as well as an adjustment tool. The piston has head venting that can adjust to three different positions to alter the air flow to adjust the power generated. 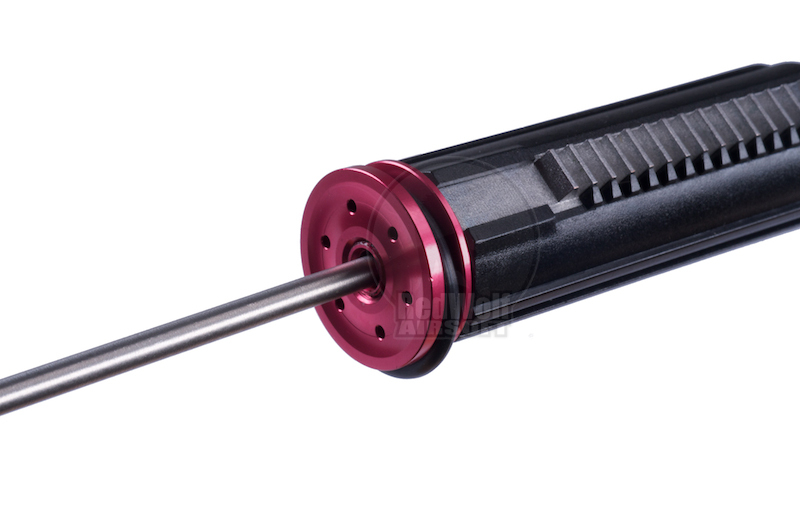 The piston installs into a normal gearbox and then the tool can be used to adjust the valve setting from outside the gun (via the barrel). The piston is polymer but has metal (steel) full teeth and a metal piston head; the use of materials lends this piston for use in higher powered setups (over 400 FPS and high rates of fire). This piston will install in to standard version 2 and 3 gearboxes but is not compatible with Tokyo Marui next-gen gearboxes (i.e. shock recoil) nor will it fit into PSG-1 gearboxes or extended cylinders. 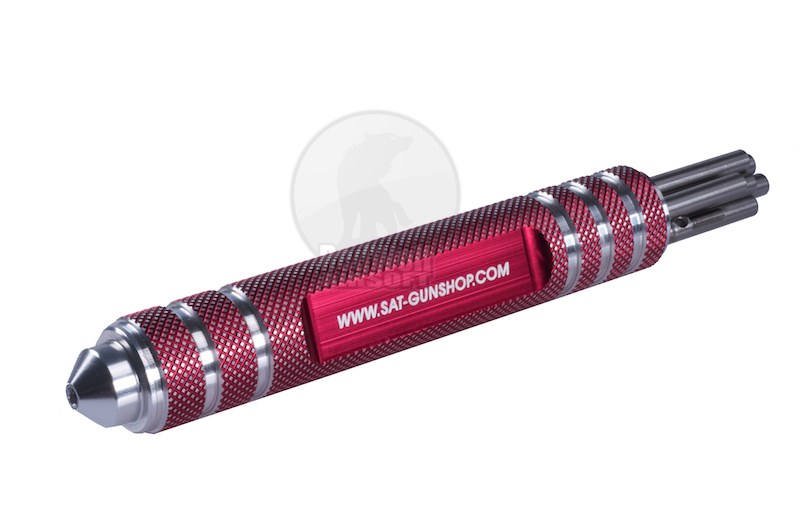 The adjustment tool is made up of a hollow metal handle and a set of metal rods. 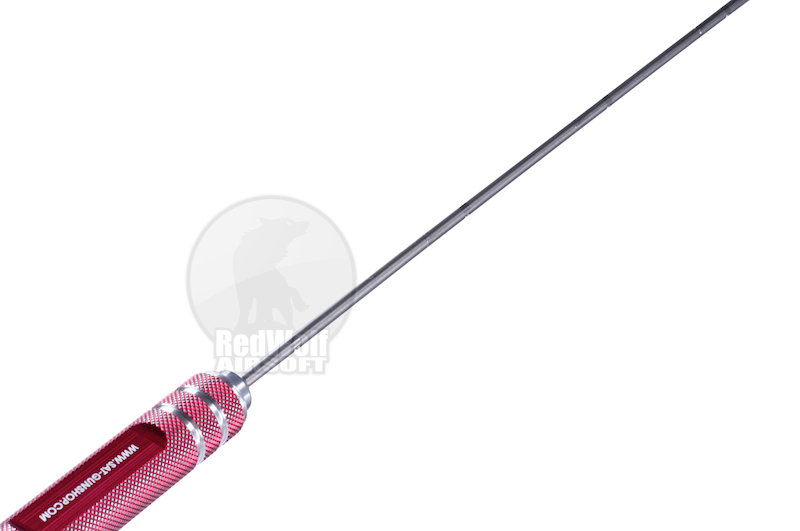 The rods can screw together end-to-end to a total combination length of 700mm. Of course you only have to use as much length as you need. Each segment has a small hole running through it which can be used with a small Allen key to get much better torque grip on it to tighten and loosen the components. The valve on the VVD piston is rather tight so the tool has to be screwed together tightly to may adjustment easier. Similarly, the tool will likely need a pair of small Allen tools to loosen if the rods are screwed together more than finger tight. 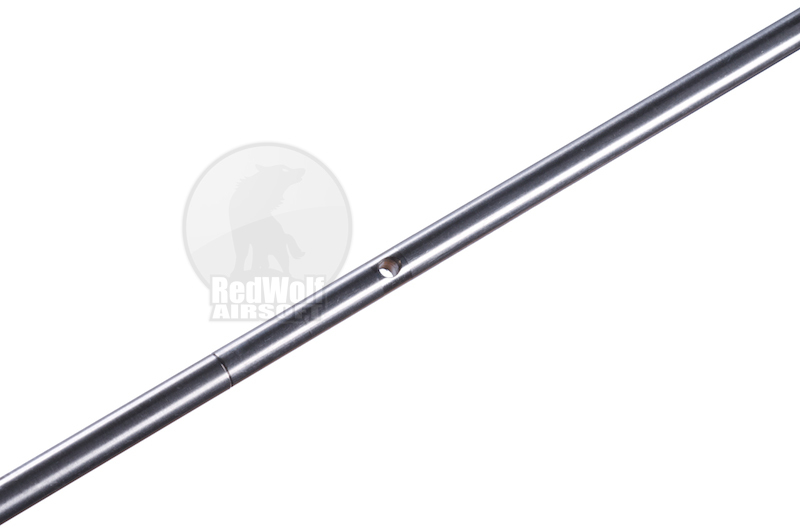 1.9 Joule Spring, 375mm Inner Barrel, 0.2g 6mm BBs. 1.3 Joule Spring, 375mm Inner Barrel, 0.2g 6mm BBs. The valve regulates well at a variety of levels and maintains consistant shot-to-shot reading across all levels with different springs. That said, it is tuned for the higher power end of the spectrum and functions best with high power springs. A 450 FPS weapon can be tuned for optimum performance for outdoor use but then dropped to 340 FPS for short range games and then dropped right down to 270 FPS for indoor games. An expensive gun that is terribly high performance could only be used in outdoor and high power games but this simple mod lets you use it any game simply by dropping the power. 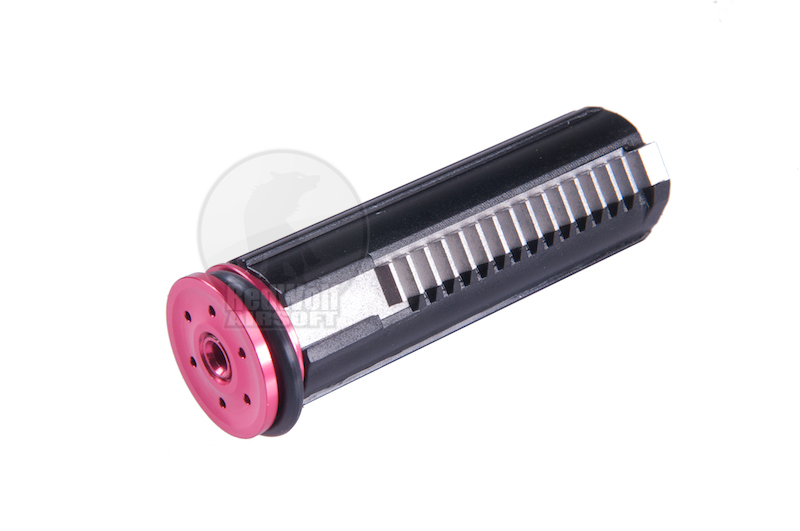 RedWolf Airsoft does not condone cheating and clearly this device could be used to alter FPS power of guns after clearing a pre-game power testing. We would like to point out that cheating in Airsoft is ALWAYS a possibility. Players can alter post-tested gun labels, they can sneak in special ammo, they can refuse to call their hits. At the end of the day, cheating is done by cheaters and the only way to regulate such things is to stick to playing with people you can trust. If your playing with good people, using a VVD to cheat should be no more of an issue then not calling your hits. That said, we do respect that game sites will reserve the right to restrict the VVD if they feel it is a risk. RedWolf Airsoft provides top quality products and expert customer service but it is you who has to work out if your local site will let you use your specific technology or not. - Standard Version 2 Gearbox. - Standard Version 3 Gearbox. - Next-Gen Marui Gearboxes (i.e. shock recoil). As the piston has steel teeth make sure you have good gears. Over time, steel piston teeth can grind down cheap, low quality gearbox gears. When purchasing this piston, consider stepping up to better gears if you have not done so already (a good choice is Systema gears). The metal piston head also creates a wear issue; ensure you have a decent gearbox as repeated impact from a metal piston head can damage and crack low quality ones. If you already own this kit and want to by extra SAT VVD pistons without the tools (because it costs less! ), see our RELATED PRODUCTS section below or search for SAT-PISTON.